Northern counties were hit the hardest by the snow storm. 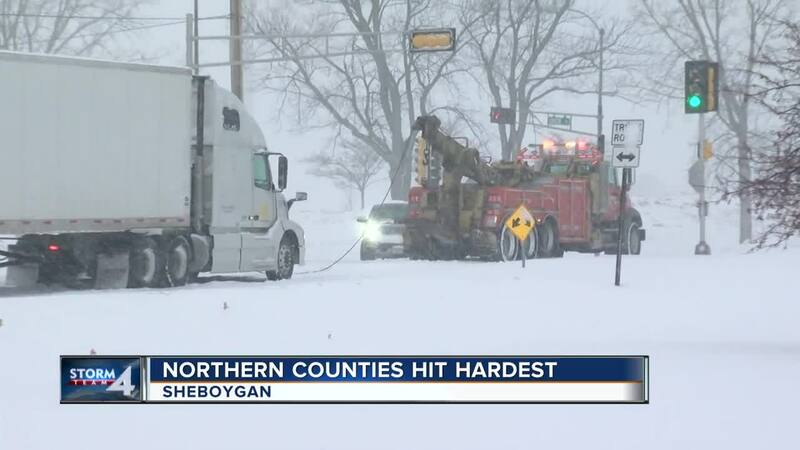 SHEBOYGAN — Sheboygan was hit hardest by one of the heaviest snowfalls of the season Tuesday. Parts of the county saw upward of 11 inches of snow. The school district was closed and so were many businesses, but it didn't stop everyone from getting about their day. "Not the first time it's snowed," Alisha Daun said. "So, just go with it." Daun had to drive in from St. Cloud. She says her drive wasn't too bad because she took it extra slow. All of that changed when she tried to pull into her job's parking lot. "I got stuck getting into our driveway at work," Daun said. "It was a rough end of the drive." Stuck was the operative word across the area. Whether it was a personal vehicle, semi or city bus, everyone had trouble on the roads. "This morning, my wife got stuck getting out of the garage into the alley," Joe Cardarelli of Sheboygan said. "I don't understand why anybody would be out here with a car. In a 4x4, it's bad enough." Cardarelli saw a semi get stuck near Taylor Drive and Union Avenue. Police blocked traffic in one direction for safety. "That was really surprising," Cardarelli said. "Every once in a while with the snow, semis get stuck on that hill. The cops had to close that part of the road for a while. People were trying to go in oncoming traffic around it, then people were coming down. It was going to cause an accident." There are lots of crashes during snowfalls, but they're not all automotive. With the density of this snow, it can cause quite the stress on the body. Those with health conditions should take it easy when shoveling or have someone do it for them. "I take lots of breaks and lots of water," Michelle Zabel of Sheboygan said. "I use my knees and legs a lot instead of my back." Zabel was working on round two of shoveling her sidewalk. She got out early, but it got covered again after plows tossed more snow from the street on her walkway. "It's not intentional," she said. "They're doing a good job on the roads, and we appreciate that." "It's good exercise," Zabel said. "I'm sweating underneath. It's a great workout, and it's good to be outside. You're cooped up with all the cold weather we have. Nice to be out and enjoy the fresh air. I think this feels like a heat wave."